The best way to describe The Evil Dead and the entire series which followed (The Evil Dead II, Army of Darkness) is as a hysterical and ferocious funhouse of the macabre and the gorily grotesque. Equal parts slapstick comedy with genuinely scary moments, Sam Raimi's directorial debut is a testimony to what can be accomplished with a limited budget, a great deal of imagination, and an intense passion for making movies. It serves as proof that atmosphere and mood can yield a truly fun and frightening experience, not just blood and guts alone. Granted, the film obviously doesn't shy away from the gore and graphic violence. 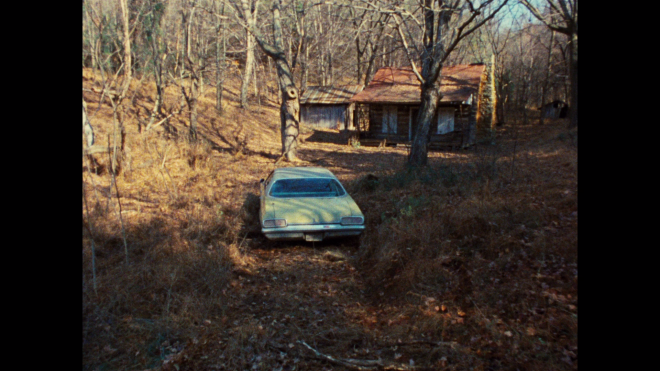 But with ambiance and tone established early on, The Evil Dead makes for a great and exciting horror feature. With less money than it would cost to draw robot scrotums for Michael Bay's next blockbuster, Raimi gathered a group of friends and acquaintances to the backwoods of Tennessee and made movie history. At least, it's history to genre fans. In many respects, the film is experimentation on unbridled style and technique, full of fanatical, manic camera movements and extreme angles that work on disorienting and terrifying audiences. This is made more surprising by the fact that the director was only 21-years-old at the time of filming. Whatever amateur mistake or approach can be pointed out in the movie — of which there are plenty — is easily overlooked for the sheer enthusiasm and exuberance on display. The filmmakers clearly love what they are doing, and they're sharing this zeal and mania with their audience. Following the same general story structure of Raimi's short film, "Within the Woods," the film follows five college students traveling to an isolated cabin for the weekend. 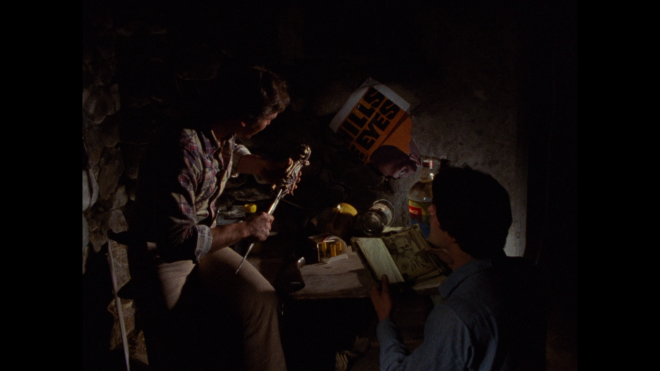 While exploring the basement, Scotty (Richard DeManincor) and Ash (Bruce Campbell) find "The Book of the Dead" and a tape recorder with the voice of a man reciting an incantation that resurrects malevolent demons. One by one, they are possessed, starting with Cheryl (Ellen Sandweiss) in the famous vine scene that caused quite the controversy and made The Evil Dead one of the first films to be included in the infamous video nasty list of the UK. After Shelly (Theresa Tilly) is also taken and later hacked up to pieces, Linda (Betsy Baker), too, becomes a deadite and sings one of the creepiest nursery rhymes around. After principal photography ended, it took still another year to complete the entire project, which led to several reshoots with stand-ins, or what's now known as "Fake Shemps" thanks to Raimi's obsession with The Three Stooges. It's actually quite amusing to catch the changes in body types and gestures as the film progresses, especially a slight age difference in Bruce Campbell towards the final moments. 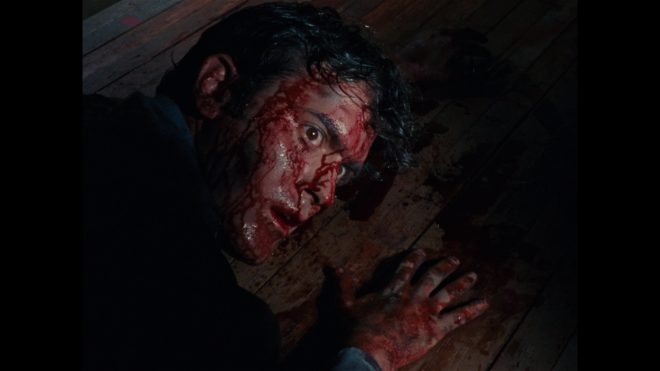 But it's to the credit of the editing process, which the Coen Brothers assisted in, that Raimi's unique and imaginative visual style is turned into an organized and intelligible 85-minutes of brutal, blood-soaked lunacy. Look at the sequence when Ash contemplates dismembering his girlfriend with a chainsaw to see the collaborative efforts come together in terrific, fluid synchronicity. And lest we forget, who knows where the whole series would be without Bruce Campbell's brilliant and "chin-tastic" performance as the enduring, Ash Williams of S-Mart Housewares. Fans continue to revisit the series, and its other incarnations, partly because it's a Raimi movie, but also to revel in the next adventure of this pessimistic, accidental superhero. We just can't get enough of him and his bitterness towards his fate. 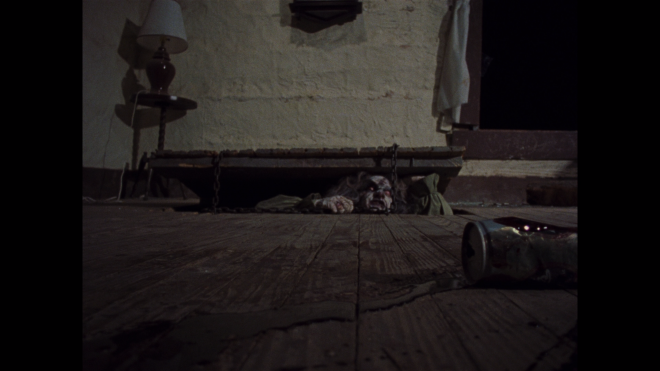 What it ultimately boils down to is that Evil Dead deserves some considerable appreciation. Not only for its immense influence to future filmmakers, to which Eli Roth's Cabin Fever admittedly owes a great deal, or that its director now carries some pull within Hollywood, but also for its achievement as a long-standing favorite in the horror cinema universe. 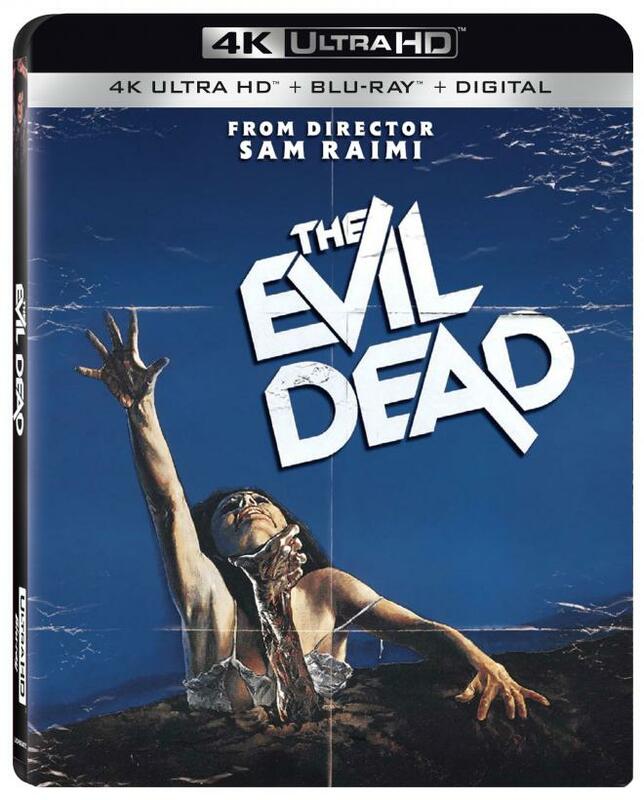 Lionsgate Home Entertainment brings The Evil Dead to 4K Ultra HD Blu-ray as a two-disc combo pack with a flyer for a Digital HD Copy. The dual-layered UHD66 disc sits comfortably opposite a Region A locked, BD50 disc inside a black, eco-cutout case with a glossy slipcover. The aforementioned Blu-ray is the same 2010 disc with only the audio commentary as a supplement. At startup, the disc goes straight to an animated main menu with a still photo of the cover art, lighting sounds, and music. Ashley Joanna Williams battles the forces of evil equipped with a shocking, eye-gouging, appallingly excellent HEVC H.265 encode that unexpectedly improves what producers did for the 2010 Blu-ray release. But, as I mentioned in my review of that limited edition, there is really only so much that could ever be done with the source material, and the picture quality will never attain reference or ever compare to other catalog titles shot on better stock. So, with that in mind, expectations should be kept at moderate levels because, overall, the 2160p transfer, likely coming from the same remaster of the original 16mm camera negatives, is generally soft and blurry. However, at its best moments, definition and resolution enjoy a notable uptick, looking sharper and fresher than ever before. The wrinkles in clothing are highly detailed with better, more lifelike textures in the fabric and threading, and the make-up effects are more apparent and laughably cheap. We can better make out the dirt and grime of the neglected, broken-down cabin, and the grain in the wood is fairly distinct. The biggest and arguably most marked improvement are the brightness levels, which were already terrific on the Blu-ray but somehow look more polished and luxurious here. The 1.33:1 image is bathed in deep rich blacks and stygian midnight shadows that provide this cult horror classic with a gorgeous cinematic appeal. Best of all, visibility within the darkest, murkiest corner remains excellent for a low-budget production of this caliber. On top of that, the 4K video also enjoys better contrast, giving the gory scares a welcomed pop while whites look crisper and more radiant without blooming. Sadly, specular highlights don't receive much of a boost, which honestly is not surprising, but metallic surfaces do come with a brighter, more realistic shine, such as the blade of the Kandarian Dagger. And better still, the Dolby Vision HDR presentation allows for the macabre, funhouse theatrics to gush a heaping display of richly-saturated primaries. While blues and greens are noticeably striking and livelier than its HD SDR counterpart, a variety of reds are ultimately the real winners, lavishing the most gruesome scenes with deep crimson bloods, splattering Bruce Campbell's face with thick lipstick cherry goo or making the deadite makeup seem more clownish with a mix of scarlet ruby and odd blushing pinks. Secondary hues also show a bit more variation, particularly in the yellow leaves of trees and the fiery orange flames of the fireplace. A genuine highlight is towards the end when the corpses melt, and in the stop-motion animation, we see a spectacle of colors mixing and blending into one another while facial complexions appear healthier with a welcomed rosiness in the entire cast. The deadites ruin a perfectly good time with the same 5.1 Dolby TrueHD soundtrack enjoyed on the previous Blu-ray release, which is not a bad thing because the spooks and scares are in full blast on this lossless mix. Imaging is marvelously wide and immersive, showing terrific fidelity and resounding separation in the many off-screen atmospherics. The low-end and rear activity are fairly limited, which is understandable given the source material and budget production, but the front soundstage is highly engaging with an endless array of ambient effects filling the screen and delivering precise, crystal-clear dialogue. Surprisingly, the design lends itself rather nicely to the receivers' Dolby Surround or DTS: Neural:X up-mixing functionality, effortlessly spreading a few of those atmospherics into the front heights. Failing to make this UHD version the worthy upgrade die-hard fans and collectors have become accustomed to over the years, Lionsgate ports over the same Audio Commentary heard on the 2010 Blu-ray edition, which can be enjoyed on both the UHD and the accompanying Blu-ray. In it, writer and director Sam Raimi is joined by producer Robert Tapert and star Bruce Campbell, and the three spend most of the time joking and having fun. However, they manage to also talk extensively about the production's history and some technical aspect while also swapping some memories and various anecdotes. 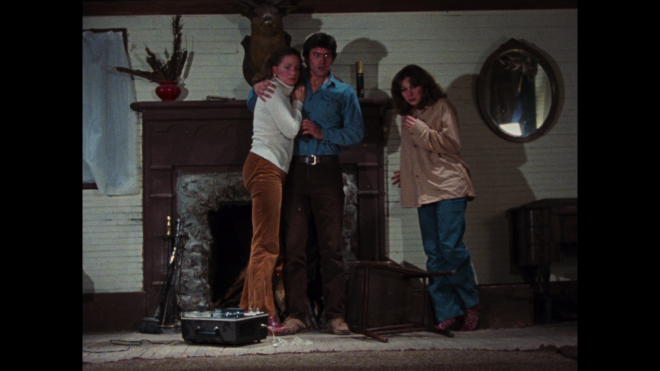 The Evil Dead is Sam Raimi's feature film debut about a small group of college friends wanting to spend a quiet weekend in an isolated cabin. Instead, they inadvertently awaken a faction of malevolent demons which possess their bodies, one by one. The classic 80s horror feature is a great funhouse thrill ride, full of enthusiasm and manic excitement to entertain its audience. Nearly forty years later, the film still holds up, providing plenty of frightening scares along with the comedy. The cult horror classic delivers comedic scares on 4K Ultra HD Blu-ray with an excellent Dolby Vision HDR presentation that surpasses its HD SDR counterpart, making it, without a doubt, the very best the movie has ever looked. Porting over the same, highly-enjoyable Dolby TrueHD soundtrack as before and one lone supplement, the overall UHD package may not tempt loyal fans to immediately upgrade, but any enthusiast of horror cinema and true-to-the-soul die-hard fan also wouldn't want to miss out on this latest, recommended video version of a long-time favorite in the genre.